Gold may get all the attention, but silver is still highly valuable. Anything that’s made of silver can be exchanged for top dollar at Pawn Big Palmdale . Why just leave your silver items sitting in a box, unused? Turn them into something you can really use – cold hard cash – at Pawn Big Palmdale today. Plenty of people are thrilled to find that their silver antiques are worth a lot of money. 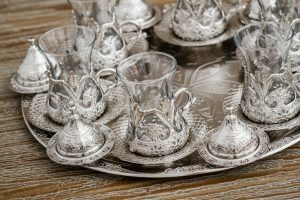 Wondering how much that silver tea set you inherited from your grandma might be worth? Tired of dusting and polishing your silver antiques, and wish you could just have some extra money to pay your bills or give yourself a treat? 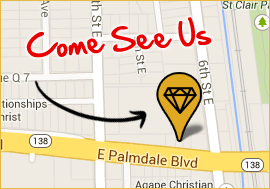 Now is the perfect time to bring your silver antiques to Pawn Big Palmdale . One of our expert appraisers will be happy to evaluate your silver antiques and give you a cash offer on the spot. Our store in conveniently located in Antelope Valley – at 557 East Palmdale Blvd. Palmdale, CA 93550. We’re ready and willing to offer you cash money for your unwanted silver – no matter what its age or condition may be. Bring us your silver jewelry, watches, flatware, tea sets, coffee urns, souvenirs, and any other solid silver items you have. Stop by our store to get an offer you simply can’t refuse for your silver items. You’ll receive a cash payment within minutes. Imagine what you’d do with some extra cash – the choice is yours. When you come to Pawn Big Palmdale , the process is as easy as 1-2-3. First you bring the item in, we give you a thorough appraisal, and then you get the cash you need and want within minutes. If you choose to sell your items to Pawn Big Palmdale outright, great – or if you’d like to pawn them, that’s cool too. The cool thing about pawning your items at Pawn Big Palmdale is that eventually, your items will be returned to you. After paying off the loan, including any applicable interest, your silver items will be dutifully retuned to your possession. Before you agree to pawning your item, our staff will be happy to go over all the loan terms with you to make sure you understand completely. Then, just the same as you would if you sold the silver items to us, you’ll be able to walk out with cash in-hand within minutes. Rest assured that during the loan repayment period, your items will be securely stored in a bank vault. They’ll be safe and secure until the repayment period ends and you come back for your items. Whether you choose to sell or pawn your items, you’ll get the $$$ you need today. We’re prepared to give you a cash loan for any amount between $2,500-$100,000. What are you waiting for? Come to our store now! Pawn Big Palmdale is the best place to store your items. Come to our Antelope Valley store today.